Check here for recent reports on file with the Mt. Laurel Township Police Department. On Feb. 17 at 9:31 p.m., patrols responded to the area of Route 38 and Midlantic Drive for the report of a possibly intoxicated driver. Patrols located the vehicle and conducted a motor vehicle stop. The 21-year-old driver from Mt. Laurel was subsequently arrested for DUI. On the passenger seat of the vehicle was a loaded hypodermic syringe and CDS paraphernalia. The driver was charged with DUI and other motor vehicle violations. He was released to a family member pending a future court date. On Feb. 17 at 8:13 p.m., patrols responded to a motel on the 600 block of Fellowship Road for a male and female dispute. While investigating the incident in one of the rooms, patrols located a loaded revolver in plain view, which police determined to be stolen out of Alabama. Additionally, patrols recovered a quantity of marijuana packaged for distribution and a large sum of money. Officers arrested a 29-year-old male from Camden. He was charged on a warrant with possession of a handgun, possession of a weapon with the intent to distribute CDS, unlawful possession of a handgun, possession of CDS with intent to distribute, receiving stolen property and hindering his own apprehension. He was committed to the Burlington County Jail pending a future court hearing. On Feb. 17 at 6:18 p.m., patrols responded to the area of the 1100 block of Route 73 for the report of a motor vehicle crash. During the crash investigation, patrols detected an odor of marijuana emanating from one of the vehicles. A search of the vehicle revealed a quantity of marijuana and a grinder. The 20-year-old male from Woodlyn, Pa. was arrested and charged on a summons with possession of marijuana and possession of drug paraphernalia. He was released pending a future court date. On Feb. 17 at 8:08 a.m., patrols responded to Crows Nest Court to attempt to locate a suspect who had a warrant for his arrest. Upon arrival, two suspects ran from a residence and were told to stop by officers before running into a wooded area. After they refused to stop, officers established a perimeter and an Evesham Police K-9 responded for a track. A 19-year-old male from Mt. Laurel was located during the track hiding in a storm drain. He was subsequently arrested. He was found to be in possession of a quantity of marijuana, packaged for distribution. The K-9 track continued and the second suspect, a 20-year-old from Mt. Laurel was located and also arrested for a burglary warrant issued by the Burlington County Sheriff’s Office. He was also charged on a summons for resisting arrest by flight. He was committed to the Burlington County Jail for his outstanding warrant. The first suspect was charged with possession of marijuana with intent to distribute, resisting arrest by flight, and hindering the apprehension of another. All charges were on a warrant and he was committed to the Burlington County Jail. On Feb. 16 at 11:16 p.m., patrols conducted a motor vehicle stop on Hainesport Road in the area of Maple Avenue after observing the vehicle having driver side damage and driving on two flat tires. Investigation revealed that the 40-year-old male driver from Marlton was under the influence of alcohol. He was arrested and charged with DWI and other motor vehicle violations. His blood alcohol content reading was .25 percent. He was released to a family member. On Feb. 16 at 11:16 p.m., patrols responded to a business on the 3100 block of Marne Highway for the report of the store receiving two counterfeit $100 bills. The store employee stated that during the night shift a black male and black female entered the store and passed two separate $100 bills. Investigation revealed that both bills had the same markings and serial numbers. On Jan. 31 at 9:37 p.m., patrols attempted to conduct a motor vehicle stop on in the area of Fellowship Road on a Dodge Ram 1500. The vehicle did not stop and fled the area. Patrols again located the vehicle in the area of Church Road and again the vehicle fled. After an investigation, patrols arrested a 32-year-old male from Morton, Pa. after he turned himself in at headquarters on Feb. 15. The male suspect was charged with eluding on a warrant and committed to the Burlington County Jail pending a future court date. On Feb. 15 at 9:16 a.m., patrols responded to the area of West Park Drive and Fellowship Road for the report of a disturbance. While investigating the involved people, a 20-year-old male suspect from Burlington was arrested for providing a false name to avoid the detection of an outstanding warrant for his arrest for robbery. The male was charged on a summons and turned over to the Burlington County Jail for his outstanding warrant. On Feb. 14 at 3:54 p.m., patrols responded to the area of Route 73 and Rogers Walk for the report of a motor vehicle crash. While in the area, officers came in contact with a 25-year-old male from Lumberton who was exhibiting erratic behavior. A check of the male subject revealed two traffic warrants for his arrest. Search incident to arrest revealed a quantity of marijuana. He was charged on a summons with possession of marijuana less than 50g. He was then turned over to the state police for his outstanding warrant. 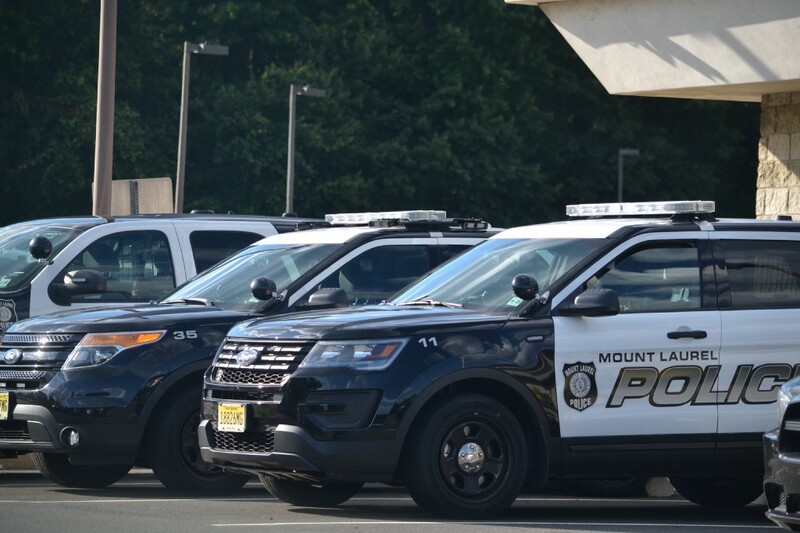 On Feb. 13 at 7:25 p.m., patrols responded to Rowan College for the report of a theft of a cell phone. The victim reports that she left her cell phone in the women’s bathroom by accident. When she returned to retrieve the phone it was gone. There were also credit cards in the phone holder that were fraudulently used. On Feb. 13 at 7:39 p.m., patrols responded to Faith Court for the report of a suspicious vehicle. The victim reports that she observed an occupied vehicle driving around the area. Shortly after seeing the vehicle, she went outside and found one of her vehicle tires to be flat.